Lasting memories, new experiences and best friends are part of what makes summer such a special time. As a local leader in youth development for more than 52 years, our Y provides children with positive and fun experiences that build confidence, new friendships and a sense of belonging that will last beyond the summer. From swimming to the arts, your child will discover a summer of exploration and new skills taught by our highly-trained staff. Our curriculum has been developed to help close the summer learning gap - while school’s out of session - integrating physical exercise, structured /spontaneous play, literacy, STEM-based activities and more. 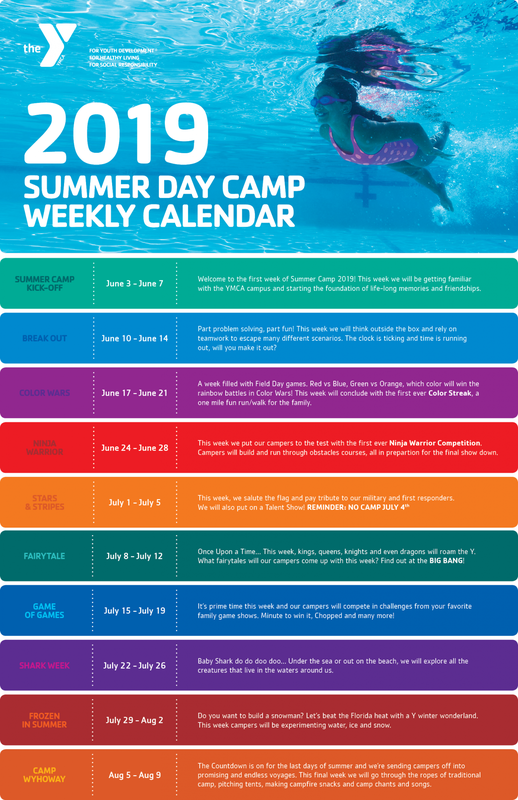 Check out our 2019 Camp Guide to start planning the BEST SUMMER EVER! Our 2019 weekly themes are here! The weekly themes create an atmosphere of fun and learning, while being centered on the Y's core values. Session themes are designed to add a little individuality and excitement to each session. The themes guide the weekly activities like arts & crafts, games, contests and team building. Join us for a safe and memorable summer! Y camp is a 170-year tradition. Be part of the history this year. Campers engage in age-appropriate activities designed to advance cognitive and social development. Registration is flexible to meet the needs of every family. CAMP HOURS: Summer Camp runs Monday - Friday, from 7:00 am to 6:00 pm. Half Day Sports Camps offer youth sports training in basketball or volleyball, led by our knowledgeable and experienced staff, in a day camp setting. The activities are designed to teach basic skills and refine existing ones, ensuring that every camper gains achievement with each sport regardless of their ability or experience. In addition to skill development, Sports Camp also emphasizes the importance of self-confidence, sportsmanship, and teamwork. 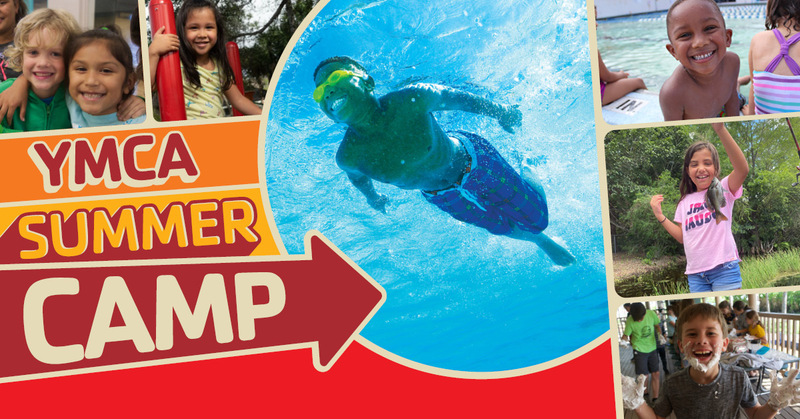 Enroll your child in one of our sports camps and our summer camp program for one low price! The sports bundle option will be available during the summer weeks we offer sports camps. CAMP HOURS: Summer Camp runs Monday - Friday, from 7:00 am to 6:00 pm. Sports camp is from 12:30 pm - 3:30 pm. In the Y's Tennis Camp, children can excel from the very first ball they hit up through tournament play. Come enjoy a full week experience taking our afterschool training to a half day camp format. Tennis, fitness, fundamentals, strategy, mental focus and fun! TENNIS CAMP HOURS: 9:00 am - 12:00 pm, Monday through Friday (drop off after 8:30 am and pick up by 12:30). CAMPERS SHOULD BRING WATER, SUNSCREEN, SNACK AND A HAT! IN-PERSON REGISTRATION ONLY: To register YMCA Tennis Camps, stop by the Tennis Center. Please complete a registration form for each child you are enrolling. EARLY BIRD REGISTRATION: MARCH 1 - MARCH 4: Pay no registration fee when you sign up 3/1-3/4, that’s a $100 savings! There is a one time $100 registration fee for camp registration. To register in-person, please download, complete and return the registration form to the Main Desk beginning March 3rd. Please complete a registration form for each child you are enrolling. There is a one time $100 registration fee for camp registrations. CIT Camp is designed specifically for those teens looking to develop leadership skills, prepare for lifelong success and become a Y Camp Counselor! CIT's will earn valuable volunteer hours that can be counted towards their high school graduation requirements. The camp is for teens ages 14-17. The program is broken down into two 5 week sessions. CIT's may select one or both sessions, but are required to do at least 5 consecutive weeks Monday through Friday. Sessions are limited to 20 spots each. Participation in the CIT program is by application only. Selected applicants will be invited to an interview and reference check procedures. REGISTRATION: We are accepting applications through May 17th. Selections will be made shortly after. Download the Registration/Reference Form below and return to Angeliz Ramos at aramos@greaternaplesymca.org or to the front desk at the Naples YMCA.